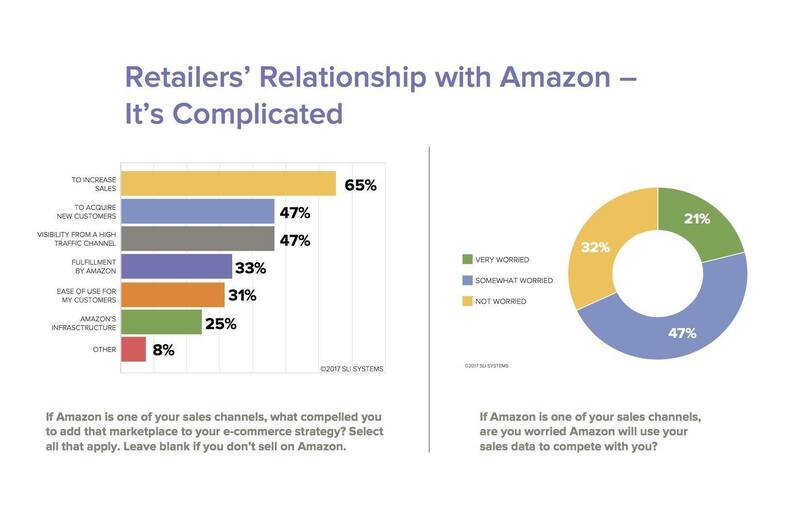 SAN JOSE, Calif. – July 11, 2017 – A new report published by SLI Systems(SLI.NZ), a global leader and provider of e-commerce solutions and services, finds many retailers worldwide view Amazon as both friend and foe, relying on Amazon for visibility and profitability – but with some concern, due to the potential of competition from their marketplaces. In this second quarterly 2017 E-commerce Performance Indicators and Confidence Report, SLI Systems provides survey findings from 213 e-commerce professionals around the globe. Respondents represent mid-size retailers, with a mix of business models, including pure e-commerce, as well as omnichannel merchants. The full report is available for download at http://sitesearch.sli-systems.com/epic-report-q2-2017. While improving the customer experience remains crucial, there is a renewed focus this quarter on purchasing or implementing e-commerce platforms that will bolster great experiences. In addition, retailer forecasts for online and mobile revenues continue to be strong worldwide, despite declines in confidence this quarter compared with Q2 2016. Also a good sign, far more omnichannel retailers plan to increase, rather than decrease, the number of stores in 2017. E-commerce Revenue: 86% of respondents expect their e-commerce revenue to increase this quarter compared to Q2 2016. UK retailers appear the most optimistic with a third predicting e-commerce revenue growth at 21% or more. Mobile Revenue: 81% expect revenue from mobile sites and apps to increase in Q2 2017 compared to Q2 2016; 22% expect a boost of 21% or more. In-Store Revenue / Profit: 39% expect an increase, with 14% expecting a decrease; in Q1 2017, 46% of respondents expected an increase. Acquisitions: Fewer retailers plan to acquire companies; in the U.S., the percent declined to 14% in Q2, from 25% in Q1. Expansion: Fewer plan to add websites or brands (34% in Q2, down from 40% in Q1) or to expand the number of products or product lines they offer (78% in Q2, down from 84% in Q1). New Technology: The number of respondents planning to purchase or implement new technology this quarter dropped to 57% in the U.S. and 48% in the UK, compared to 63% and 64% in Q1, respectively. CX and Replatforming Top Initiatives: Customer Experience (CX) remains king despite declining as the top choice, to 20% from 26% in Q1. Replatforming climbed to the second top priority with 17% in Q2, up from 11% in Q1. Brick-and-Mortar Stores: 22% of respondents expect to increase their number of stores by up to 10% in 2017. Regionally, a massive 44% of retailers in Australia and 24% in both the U.S. and UK will increase the number of storefronts. Holiday 2017 Planning: June is the most popular month for retailers to start holiday planning; June tied with January as the peak month for purchasing holiday inventory. Q2 2017 EPIC Report results are from an electronic survey conducted between May 4 – June 2, 2017. SLI received qualified responses from e-commerce professionals worldwide headquartered primarily in the U.S., Europe and Australia. All respondents sell goods or services online, with 66% selling in stores and 44% on Amazon. Ninety percent of respondents work in a manager position or above and 54% report their company’s total annual sales to be above $50 million (U.S.) with 24% generating more than $500 million. SLI Systems (SLI.NZ) accelerates e-commerce for the world’s top retailers by generating more traffic, converting shoppers into buyers and maximizing order values through solutions that improve site search, navigation, mobile, merchandising, personalization, recommendations and SEO. SLI is the most chosen SaaS-based site search provider to Internet Retailer Top 1,000 retailers. The SLI Buyer Engine combines user behavior and machine learning to accurately predict what shoppers are most likely to buy, shortening the path to purchase. The SLI Commerce Console™ organizes key sales insight and tuning capabilities into one easy-to-use cloud-based console. SLI operates on five continents and offers solutions in 20 languages. For more information, visit www.sli-systems.com or connect with us on Twitter @slisystems.